What makes a pianist a “legend”? I’d say personality is the key ingredient in a mix that includes virtuosity, particular insights into the music of key composers, and special aspects of artistry that appeal to important segments of the audience. It helps too, if the pianist enjoys (or suffers) personal idiosyncrasies that attract extra helpings of attention. Since Vladimir Horowitz scores high on all those parameters of legendhood, he’ll lead this roundup of worthy recent releases by pianists enjoying various degrees of legendary status. 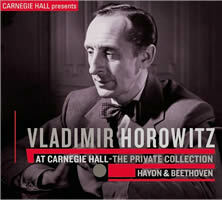 “Vladimir Horowitz at Carnegie Hall: The Private Collection, Vol. 3.” Franz Josef HAYDN: Piano Sonata No. 62 in E-flat major (1794). Ludwig van BEETHOVEN: Piano Sonata No. 21 in C major, Op. 53 (“Waldstein”) (1803-4); Piano Sonata No. 14 in C-sharp minor, Op. 27 No. 2 (“Moonlight”) (1801). Vladimir Horowitz (pno). RCA 8869754605 (http://www.sonymasterworks.com/). 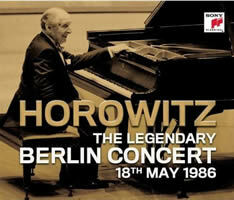 “Horowitz: The Legendary Berlin Concert May 18, 1986.” Robert SCHUMANN: Kreisleriana, Op. 16 (1838); Träumerei (1838). Frédéric CHOPIN: Mazurkas, Op. 17 No. 4 (1832-33) & Op. 7 No. 3 (1830-31); Polonaise in A-flat, Op. 53 (1842). Works by Domenico SCARLATTI, Franz LISZT, Sergei RACHMANINOV, Alexander SCRIABIN, Moritz MOSZKOWSKI. Vladimir Horowitz (pno). Sony 88697604812 (2 CDs) (http://www.sonymasterworks.com/). The Carnegie Hall disc is the latest in a series of recitals recorded for Horowitz’s personal archives. Donated to Yale, they’ve been mined for a fascinating series that, while often duplicating his studio recordings, offer performances made all the more spontaneous due to the presence of an adoring audience. While Horowitz was best known for his spectacular performances of virtuoso Romantic-era repertory, he was also a sympathetic interpreter of the Viennese classics. This 1948 version of the Haydn Sonata, for example, is a reminder that he recorded the work back in 1932, before many concert pianists were even aware of Haydn’s wonderful keyboard works. Some rigid classicists may be offended by the wide dynamics and colors Horowitz projects but they’ll have to admit the performance, and especially its “playful” aspect, does no violence to the Sonata and even enhances its impact. The “Waldstein” is idiomatic, full of drama and power, and while the “Moonlight” exhibits an excess of swoony sentimentality in its first movement, it’s also admirable for Horowitz’s delicate wash of colors and for an electric Finale. The Berlin Concert finds Horowitz in top form almost 40 years later, this time in the Romantic repertoire more closely associated with him although the crisply articulated Scarlatti Sonatas should remind us that he pioneered that composer while his keyboard colleagues were leaving those sparkling gems to harpsichordists. Again, there’s plenty of duplication with his studio recordings and, once more, an extra frisson is supplied by an enthusiastic audience. A few minor — very minor — slips sprinkled throughout the concert offer evidence that the keyboard magician was human, while his penchant for clarifying Schumann’s dense textures and bringing out details lost in most other versions pays dividends in Kreisleriana. Horowitz’s color-drenched Chopin Mazurkas are a high point, though Liszt’s Sonetto del Petrarca No. 104 and a pair of Scriabin’s Etudes run them close. The back cover calls the concert “one of the great moments of music history.” It’s not. And Horowitz doesn’t need the hype. But it is an important snapshot of the legendary lion of the keyboard roaring with vibrancy even at age 83. Franz SCHUBERT: Piano Sonata in C minor, D. 958 (1828). Béla BARTÓK: Fifteen Hungarian Peasant Songs (1914-18). Karol SZYMANOWSKI: Two pieces from Masques, Op. 34 (1915-16). Sergei PROKOFIEV: Sonata No. 7 (1939-42). Sviatoslav Richter (pno). BBC Legends BBCL 4265-2 (http://www.mediciarts.co.uk/). Distributed in the US by E1 Entertainment (http://www.e1entertainment.com/). Richter fulfilled all the requirements of legendary status and then some, for he bonded his fabulous technique to a personal vision that made the music he played sound fresh and different but also completely right, even inevitable. After some reflection, you may change your mind, believe it’s a one-off that’s interesting but too dramatic, too tense, and the pianist too obsessive in the pursuit of a vision you may or may not fully associate with the music being performed. If you hear Schubert as a lyric poet whose music should never be rushed, Richter’s ethereal opening of the C minor Sonata will satisfy, but he also gives full due to its lightning-fast mood shifts and the obsessively powerful bass strokes that keep interrupting the melody of the Adagio. These fully define the composer wracked with unbearable tensions. Richter’s Scherzo does little to lift the gloom; it’s a melancholy dance, while his Finale Allegro turns the galloping theme into a wild ride into the abyss. The remainder of this December 1970 London concert is on the same exalted level of dramatic and emotional truth that always characterized Richter’s playing. The Bartók is revealed as more than a collection of pleasant folk tunes but as a unified piece bursting with energy. The Szymanowski pair goes beyond energy to pianistic violence, while the Prokofiev Seventh is played with an inner tension and power rarely heard in versions that bypass its wartime context. The Richter legend means that the market is flooded with recordings attributed to him, but few can match this one for artistic integrity and for capturing the genius of the man in full flight. 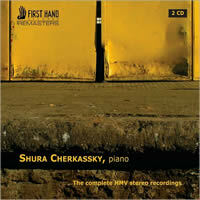 Shura CHERKASSKY: The Complete HMV Stereo Recordings. Various composers. 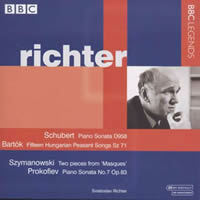 Cherkassky (pno); BBC Symphony Orchestra, Malcolm Sargent (cond.). First Hand Records FHR04 (2 CDs) (http://www.firsthandrecords.com/). Distributed in the US by Harmonia Mundi (http://www.harmoniamundi.com/). I’ve seen all of the pianists in this review in live concert performances and all projected beautiful timbres when the music requires them. But of all these legendary artists, the one I remember most for his ravishing, golden tone is Shura Cherkassky. He was also one of those free spirits who typified Romantic pianism at its best, playing with a spontaneity that often sounded as if he was improvising on the spot. That sort of communicative mastery is hard to achieve in the studio, but he came close to it in these late 1950s recordings, now beautifully remastered in their first CD incarnations by First Hand Records. The set is a valuable document of Cherkassky in his heyday (still on the sunny side of 50), all the more so since these 22 selections are either first CD releases or first CD releases in stereo. There’s only one piece with orchestra here, Litolff’s Scherzo, and it’s a lovely one, and most of the solo items are shorter encore pieces played with panache, Rachmaninov’s G minor Prelude, Poulenc’s Toccata, Gershwin Preludes, and the like. There are two versions of Chopin’s Ballade No. 3, always a Cherkassky specialty that he played with more poetry than most pianists could muster, an observation that holds for the other selections in his Chopin set (the Ballade No. 2, a Mazurka, Waltz, and Nocturne). For fireworks, turn to the Liszt Hungarian Rhapsody No. 13, S244, and for spiritual and pianistic nourishment, the longest piece in the set, the Bach-Busoni Chaconne. Cherkassky may not have been “legendary” in the sense that Horowitz and Richter were, but his throwback Romanticism and golden tone made him, in the eyes and ears of the cognoscenti, a true piano legend. 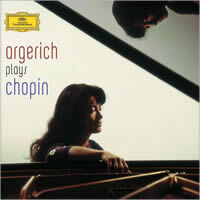 “Argerich plays Chopin.” Frédéric CHOPIN: Ballade No. 1 in G minor (1835-6); Piano Sonata No. 3 in B minor (1844); Etude Op. 10 No. 4 (1832); selected Mazurkas and Nocturnes. Martha Argerich (pno). DG 477 7557 7 (http://www.deutschegrammophon.com/). 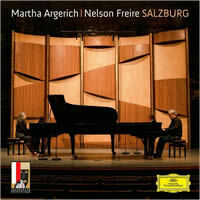 “Martha Argerich / Nelson Freire Salzburg.” Johannes BRAHMS: Variations on a Theme by Haydn, Op. 56b (1873). Sergei RACHMANINOV: Symphonic Dances, Op. 45 (1940). Franz SCHUBERT: Rondo in A major, D. 951 (1828). Maurice RAVEL: La Valse (1920). DG 477 8570 (http://www.deutschegrammophon.com/). Martha Argerich’s Chopin disc opens with a 1959 radio recording of the Ballade No. 1 in G minor made when she was 17 ½ years old. From the first notes we can hear an artist of remarkable individuality, in full command of the instrument’s resources, playing with the power, lyricism and maturity of a master pianist. Her playing has all the qualities associated with her later career — impetuous volcanic eruptions, radiant poetry, remarkably accurate articulation even at turbo-powered speeds, and a mastery of daring rubatos that make the music breathe. The rest of the disc is made up of other unreleased German radio broadcast materials from 1967. Everything here communicates directly: The Mazurkas are impetuous but never willful, speckled with rhythmic liberties that nevertheless sound perfectly right, the music freighted with drama, color and dynamic shadings; the Op. 15 No. 1 Nocturne’s lovely legato playing complemented by the controlled storm of its central section, the Etude Op. 10 No. 4, taken at breakneck speed bursting with energy. The Sonata’s first movement is played with rhapsodic fervor, the Largo movement poignant, its pain-ridden trills taking it into calmer waters. Argerich’s Chopin is saturated with the excitement of discovery, and these previously unreleased recordings remind us of her brilliance. Argerich no longer gives solo recitals and hasn’t for many years, preferring to play with orchestras, chamber ensembles, or in duo-piano concerts like this August 2009 Salzburg concert with Nelson Freire. The unanimity of their playing here is downright awesome; attacks, rubatos, dynamic subtleties, coloristic touches, and balances are remarkable, especially in a live context. The big Brahms and Rachmaninov works are familiar in their orchestral garb but within a minute or two into each, Argerich and Freire make the two-piano versions seem absolutely right, even the Rachmaninov’s intense dramatic power conveyed intact. The Schubert Rondo is a special treat, the gorgeous melodies singing forth, swathed in tonal gold. But then, so is Ravel’s La Valse — similarly drenched in color while hair-raising in its intensity. A great concert by two great artists of the keyboard. 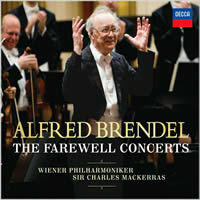 “Alfred Brendel: The Farewell Concerts.” Wolfgang Amadeus MOZART: Piano Concerto No. 9, K. 271 (1777 ); Piano Sonata No. 15 in F major, K. 533/494 (1788). Franz Joseph HAYDN: Variations in F minor (1793). Ludwig van BEETHOVEN: Piano Sonata No. 13, Op. 27 No. 1 (1800-01); Bagatelle in G major, Op. 33 No. 4 (1801-02). Franz SCHUBERT: Piano Sonata in B flat major, D. 960 (1828); Impromptu in G flat major, D. 899 No. 3 (1827). Johann Sebastian BACH: Choral Prelude “Nun komm’ der Heiden Heiland,” BWV 659 (arr. BUSONI, 1898). Brendel (pno); Vienna Philarmonic, Sir Charles Mackerras (cond.). Decca 478 2117/2118 (2 CDs) (http://www.deccaclassics.com/). If you attended any of Alfred Brendel’s annual Carnegie Hall concerts you’ll know what I mean when I say the atmosphere was more like a solemn religious occasion than a piano recital. Silent audiences listening intently, released from communion with Haydn, Mozart, Beethoven and Schubert only when the last note of a work died away and they could applaud with the enthusiasm of congregants satisfied that their gods had been properly interpreted. No coughs. No wheezing or snores. No swishing turning of the program’s pages. Not your typical New York audience, but one whose earnestness and passionate identification with the performer and his chosen repertory are unusual enough to earn for Brendel legendary status. It’s hardly a surprise that these two discs include material Brendel has recorded before, for he continually pared his repertory down to what business writers call “core competencies,” in his case the Viennese classics. The Mozart Concerto, with the Vienna Philharmonic under Mackerras, is pretty much what we recall from his earlier recordings of the work, with perhaps a touch more poetry in places. The solo works, from a December 2008 Hanover concert, include Haydn’s remarkable Variations in F minor, where Brendel once again shows what a great Haydn pianist he was, playing with intensity and point. The Mozart F major Sonata K. 533/494 and Beethoven’s Sonata No. 13 get typical Brendel readings, light-fingered and with more tonal color than one usually hears in his studio efforts. This “farewell” performance of Schubert’s great B flat major Sonata, D. 960 trumps his previous recordings of a favorite work, the music developing with an organic inevitability that draws you into the work. Encores of short works by Beethoven, Schubert, and Bach-Busoni, played with affection, round out a recital Brendelians will treasure.